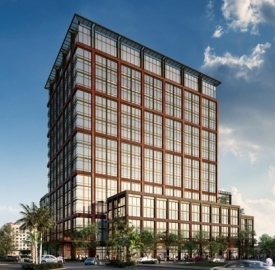 Related Companies has proposed a state-of-the-art Class A office building at the corner of Rosemary Avenue and Evernia Street in downtown West Palm Beach. Created as an innovative and sustainably advanced corporate space, 360 Rosemary will complement CityPlace Office Tower, bookending the district with two distinct, premier office buildings and improving the region’s ability to attract new businesses and create jobs. It will stand as the newest Class A office space constructed since the CityPlace Office Tower was built in 2008. If approved, construction of 360 Rosemary would begin later this year. Its development will create more than 700 construction jobs, and, once complete, the building will employ at least 1,000 people. Jon Blunk, President of Tower Commercial Real Estate, exclusive office leasing representative for 360 Rosemary, has worked with Related Companies on several successful projects – most notably – the lease out of City Place Office Tower. Located just steps away from the new Brightline high-speed rail station, the 285,000 square foot LEED Silver-designed building will bring modern architecture and best-in-class office amenities to the West Palm Beach business community. With spaces designed to appeal to a variety of industries, including creative startups, technology firms and the financial service industry, 360 Rosemary will offer a technologically and stylistically forward-thinking approach to support companies operating in today’s modern business environment. Employees and visitors at 360 Rosemary will benefit from an on-site conference center facility, fitness center, 10-foot-plus ceilings on every floor, outdoor amenities, an industrial-style lobby and ample parking for cars and bikes. Related Companies’ same expertise and knowledge that most recently leased more than eight million square feet of Class A commercial office space in Hudson Yards development – bringing more than a dozen of the world’s leading brands in fashion, beauty, technology, finance and law to Manhattan’s newest neighborhood – will be focused on bringing that same enhanced value to downtown West Palm Beach.